Wood species: Cherry, Holly, Maple and Coco Bolo. Origin USA and Mexico. Number of pieces: 221. Hours to construct: 31. Size: 12" tall x 9.5" dia. x .187" Segmented Lidded Vessel. Wood species: Maple, Brazilian Cherry, and Ebony. Origins: USA, Brazil, and Africa. Number of Pieces: 81. Hours to Construct: 27. size: 6.50" x 9" x .25" Segmented lidded vessel. Wood species: Maple, Ebony, and Mora. Origins: USA and Africa. Number of Pieces: 82. Hours to Construct: 23. size: 8" x 6.50" x .25" Segmented lidded vessel. Wood species: Red Heart, Cherry, Birdseye Maple, and Coco Bolo. Origins: Brazil, and USA. Number of Pieces: 275. Hours to Construct: 28. size: 7.75" x 10" x .25" Segmented lidded vessel. Wood species: Cherry, Maple, and Holly Coco Bolo. Origins: USA and Brazil. Number of Pieces: 301. Hours to Construct: 31. size: 15" x 8.50" x .25" Segmented lidded vessel. Wood species: Cherry, Holly. Origins: USA. Number of pieces: 202. Hours to construct: 31. Size: 12.5" tall x 9.5" dia. x .187" Segmented vessel. Wood species: Zebra wood, Maple, and Coco Bolo. Origins: Africa, USA, and Mexico. Number of Pieces: 291. 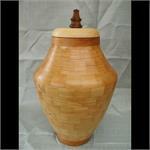 Hours to Construct: 25. size: 8" x 7.50" x .25" Segmented lidded vessel.